Bramblecrest Elliptical 8 Seat Dining Suite Cover in Khaki design provides a high quality weather-proof polyester cover suited for protecting an outdoor 285cm x 225cm x 96cm oval table from the elements. 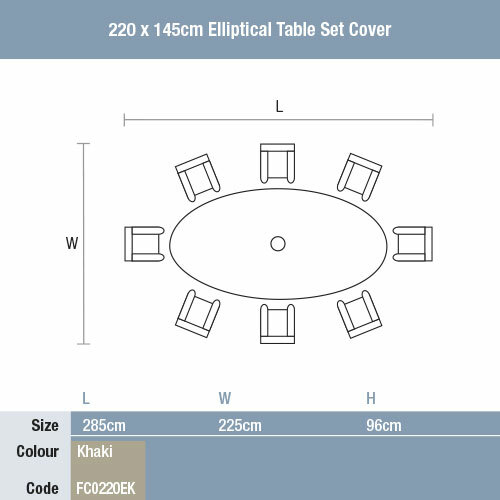 Official Bramblecrest manufactured purpose-fit cover gives full Winter protection for your cherished outdoor table, and complete water resistance due to the durable polyester fabric. Benefits from heavy duty ties and cord links to help secure in windy conditions, and air vented to prevent moisture being trapped. Comes complete with a carry bag for easy storage when not in use. Protects top and bottom of Bramblecrest dining tables.